If you know me at all one thing is inescapable - I almost always have my headphones in during the day. At my desk. During lunch. In the men's room. More often than not I'm immersed in a podcast. On a frequent basis I'll share an episode with someone at work if I think the subject-matter suits their interests. Since I get asked so frequently what I'm listening to (and often am accused of listening to nothing) I thought I'd share the four podcasts I listen to the most. What it's about (in their words): 99% Invisible is a tiny radio show about design, architecture & the 99% invisible activity that shapes our world. Why I like it: First, the subject-matter really pays off the title. The topics are more often than not about things you've never considered, but play a suprisingly important role in our daily lives. Second, I find the host's voice (Roman Mars) very calming. And finally, episodes are short (15-20 minutes) so you can get through one during virtually any commute. A recent episode that will get you hooked: It's like choosing my favorite child, but I really loved this episode about Cow Tunnels built under Manhattan. What it's about (in their words): Grantland's Bill Simmons discusses sports and pop culture with celebrities and media personalities. A recent episode that will get you hooked: This is actually a very old episode (2 parter here and here) where Simmons and ESPN personality Matthew Berry break down the best moments of Beverly Hills 90210 to the point of absurdity. It's great radio. It's the first BS Report podcast I ever heard, and it really helped put him on the map outside the sports world. 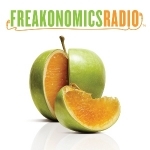 What it's about (in my and their words): Freakonomics radio - hosted by the authors of the wildly popular book franchise by the same name - "explores the hidden side of everything." Essentially it looks at everyday things through the lens of economic theory. Why I like it: It's smart. It's funny. It's accessible. It's relatable. I always feel a little smarter after listening to an episode. PLUS, host Stephen Dubner recently emailed me about a blog post I wrote inspired by two recent episodes. I thought that was nice. A recent episode that will get you hooked: It's almost a can't miss. Just dive right in. But this episode about online dating perfectly captures how they apply an economist's lens to everyday things.